Find a class that appeals to you and let me know what date you have in mind. If the date is available I will hold the date. Pricing is based on the number of people in the class. Once we pick a date and a menu I post the class and open to other students to help keep the costs down for everyone. The second option is to join a class that has already been scheduled. Simply look at the calendar to see what classes are scheduled and then go to Cozymeal (my partner in cooking) and sign up online or by calling their help line. Most classes are have between 6 to 8 people in them and are always hands-on. I’ll show you techniques to turn out great meals, demonstrate basic knife techniques, and provide cooking tips to ensure delicious meals come out of your home kitchen. Classes start at 6:00pm during the week and at 4:00 on Saturday and Sunday. We’ll get our dessert in the oven, prep our courses, enjoy a snack and then sit down to enjoy the results of our efforts. Students quickly gain confidence in their ability to make food that tastes delicious and then begin to prepare food of surprising quality at home. Some classes will showcase special recipes requiring extra steps or particular ingredients but they are still within reach of home cooks. If you have a group of friends who would like to prepare a meal together, give me a call. 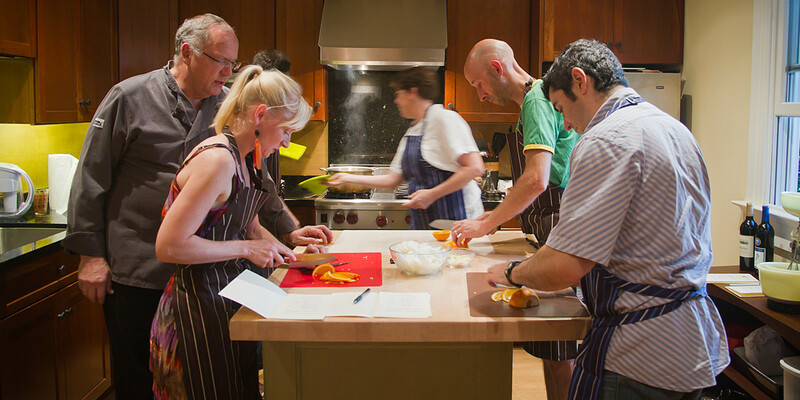 We can accommodate most any request and help you develop a personal menu for the class. Spanish cooking reflects an amazing blend of cultures with influences from all over the Mediterranean, the New World, and certainly North Africa and the Moors. This class captures the flavors and tastes of southern Spain using nuts as thickeners and spices brought to Spain by the Moors. We make a Moroccan Butternut Squash Soup with ras-al-hanout, a blend of many spices and just a little heat. Our entrée is Saffron, Almond Chicken with plenty of bread for dipping in the sauce. We make a side of an in season green and finish the dinner with a Tunisian Hazelnut Semolina Cake with Orange Blossom Syrup. I love duck, especially fall off the bone tender duck legs and thighs. I learned this recipe at my very first cooking class and have been making it ever since. This menu is straight out of France and tastes like it. We start with a Creamy Mushroom Soup and follow it with the Curry Glazed Duck Legs on Arugula with Couscous. Then we’ll make a traditional seasonal fruit Clafoutis which is a simple egg custard filled with whatever fruit is in season. This class shows you how easy it is to cook duck with tremendous flavor. Southern France has a lot in common with California and this meal joins the two places by combining the flavors from Provence with the cooking style of California. We make a refreshing Cucumber Mint Soup with Crème Fraiche. We sear Halibut and serve it with a Bouillabaisse style sauce flavored with fennel, onion, saffron and tomato over toasted bread with a garlicky aioli. To accompany the fish we make some beautiful Lemon Roasted Potatoes. To finish things off we’ll do an Almond Apricot Tart or another seasonal dessert. Take a tour of the Alemany Farmers’ Market, California’s oldest. Shop for fresh fruit, vegetables, and much more before returning to the kitchen to create a farmers market brunch. We meet at 9:00am, tour the market, meet vendors, and taste everything from strawberries to honey to olive oil.On our way back we’ll stop at a local bakery for fresh croissants and other pastries. We’ll visit a local fish market and a butcher shop to complete our menu.In the kitchen we’ll work together to create a memorable brunch. The menu will change depending on what we find that morning but we might be making fresh jam and biscuits, a vegetable frittata, corn cakes with salsa, or an apple galette. Some fruits and vegetables will be presented simply and minimally adorned. Want to learn a fast and delicious meal that can feed any amount of people? Come learn to make a paella. They can be cooked outside over a fire or special grill, or indoors on the stove and finished in the oven. All you need is a pan and hands to cut things up for fast cooking. We’ll create a vegetarian and a meat version and make a few tapas to keep us going while we cook. While perfecting your paella can take many attempts, learning to cook one is simple. We even make some Spanish style ‘punches’ which are anything but traditional.